We offer meditation instruction, Dharma Talks, and retreats on Vancouver Island and beyond. Our intention is to promote the development of the wholesome, calm, curious mind and the open, compassionate heart through study, meditation, and service. "We may not have met you yet, but come join us and explore the path of awakening!" We endeavor to provide Dharma study opportunities for new and experienced students from diverse backgrounds. We have classes on Saturday mornings in Nanaimo and on Monday evenings in Duncan. Duncan topics will be different from the Nanaimo topics, so please come to both! The schedule fluctuates depending on the teacher's availability. 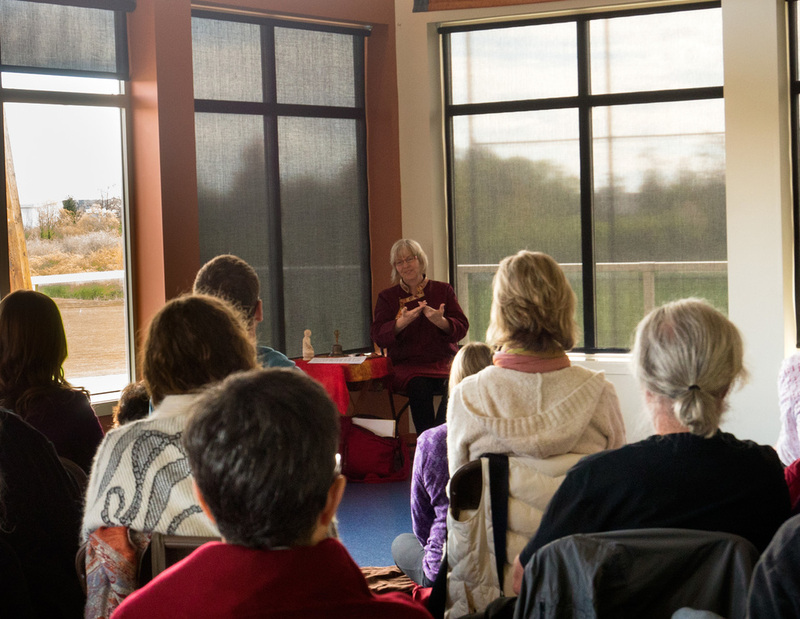 A peek into our meditation and Dharma Talk in our Nanaimo location. The Buddhist principle of “Dana”, the Pali word for generosity and giving freely helps to open our hearts. How much, what, why, and in what manner we give are all aspects of training the mind. In accordance with the tradition, most teachers do not receive any remuneration for teaching, therefore donations for teaching may be given. Buddha - The word Buddha means Awakened. The historical Buddha became a fully awake being, free from all mental suffering and able to see the nature of reality. When we are in congruence with things as they actually are, we can cease struggling against them and cultivate a peaceful mind and a happy heart. Dharma - refers to the teachings of awakening. We study the Dharma in order to train our minds and to understand the truth of impermanence or change, and to recognize they when we cling to wanting things to be a certain way we suffer. Liberation happens when we let go. Sangha - The Sangha is the community of people who are studying how to become more awake - more skillful in action, more kind and honest in speech, and more clear, luminous, and peaceful in mind. Meditation - ​refers to practices to train the mind. There are many classical Buddhist meditations, from breath practice to Tibetan tantra. At Island Dharma we study several meditation forms, all of which have the goal of removing obscurations and confusion and sharpening clarity, calm, and insight. Dana - see "About Dana" above.